368 pages | 42 Color Illus. Rebels and Renegades examines 350 years of history through the eyes of the uncompromising. Presented in nine clearly written chronological chapters, this comprehensive reference covers the major events and personalities in the history of extremism in the U.S. Besides chronicling the event itself, entries, ranging from 500 to 1000 words, include background information and historic effects. In addition to the chronology, sidebars highlight historical, biographical, cultural, and ethical aspects of the story, tying the past to the present. Topics include the influence of radical idea on the mainstream, the role of violence in radicalism, and the evolving relationship between radicals and the media. An extensive appendix of excerpts, transcripts, and full source documents round out the work. 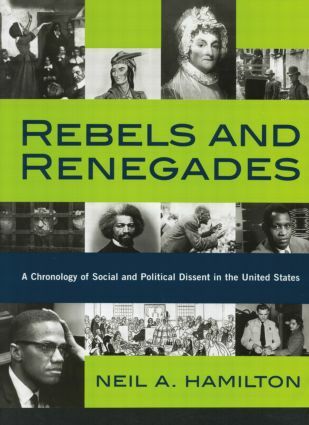 To see the Introduction, a list of detailed contents, a generous selection of sample pages, and more, visit the Rebels and Renegades website. Neil Hamilton is a Professor of History at Spring Hill College in Mobile, AL. He is a major contributor to the Atlas of the Baby Boom Generation. He is also the author of the ABC-CLIO Companion to the 1960's Counter-culture in America and Founders of the Modern Nations.